There are only a few of them but the slopes that do offer airboarding for fans of the sport are pretty famous when it comes to reputation. Airboarding is extremely popular in Europe but when it was introduced to the USA people took a different approach with it, they tried in out in their hometowns and loved it. A few of the airboarding slopes around the country are The Resort at Keystone Colorado, Hoodoo Oregon, and Loon Mountain in New Hampshire. These are the more popular slopes that allow airboarding and people are definitely taking advantage of them. Keystone Colorado is one of the more beautiful slopes in North America and its no surprise that they allow airboarding in there program. Right in the heart of the Rocky Mountains, Keystone is home to a Summit Elevation of 11,980 feet and a base elevation of 9,280 feet. Airboarders will be exceptionally happy with the force they get when gliding down the hill and with 117 trails the fun is endless. Keystone might not be for the beginners of this sport though as there are many advanced courses along the mountain. In fact Keystone only offers about 19 % of easy courses. This airboarding slope might be beautiful but for the newcomers it’s not the best to start at. Hoodoo is one of the more fun resorts that offer airboarding slopes. Located smack dab in the middle of Oregon it isn’t far from a lot of places which make it a popular place for skiers, snowboarders, and now airboaders. Hoodoo is located on the summit of the Santiam Pass on Highway 20 in Oregon. Hoodoos Autobahn which is the area in which tubers and airboarders can spend there time, offers up to 20 runs and is for all skill levels. This airboarding slope isn’t the largest of other mountains but it’s up there with a base elevation of 4,668 feet and a summit elevation of 5,703 feet. As I said before it’s not the largest resort in the USA but its 1,035 vertical foot rise will be something to experience. Loon Mountain Resort is yet another airboarding slope that offers the whole package. It’s not a very large resort but its fun for the whole family. Offering 45 trails and 5 skiing areas, it is just the right size for a day of snowy fun. It’s an intermediate course at most with a few expert slopes and plethora of novice courses. 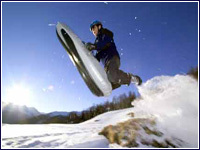 Airboarders get their own area along with tubers where the base elevation isn’t that large, at about 950 feet, and a summit elevation of about 3,050 feet. What makes this airboarding slope so great is its 2,100 vertical foot drop which is longer then some of the larger resorts. Loon Mountain Resort is definitely for novice and intermediate airboarders, snowboarders, and skiers of all ages. These airboarding slopes are among the top resorts in the USA, not only for airboarders but for snowboarders and skiers that are in the mood to get away and have a great time, whether it be in the snowy rocky mountains or the hills of New Hampshire.